The Religious Attitude Questionnaire is a proven and effective way to poll people about their spirituality – help determine their openness to hearing the gospel. It serves as an “icebreaker” for starting a spiritual conversation and can be the catalyst to enable your sharing the gospel. It also provides useful data for the church and its leadership regarding the spiritual behaviors of people that are polled. The questionnaire consists of 11 brief questions and is designed to find out where people are at in their spiritual walk, their openness to the Bible, and whether they are open to talking about spiritual matters. Jesus asked provocative questions and loved having spiritual dialogues with people and this method helps us to do the same. You can canvas your neighborhood or the one around the church and speak to whoever is available. You can also poll with this survey in a public place (say, at a mall, a park, or a busy street corner). You can set up a table at a fair or business expo. The possibilities are limited only to your imagination. For over 30 years, we’ve had great success at flea markets, mall parking lots, and other public venues doing marketplace outreach using this method. We’ve also used this approach with great effectiveness at outreach events, polling those who are kind of on the fringes, and in altar counseling during sanctuary and event evangelism. For a review of the results of using this polling technique to gather data download the Results from Religious Attitude Questionnaire Surveys in Lakeland, Fl 2008-2014. We usually present the questionnaire in pairs when appropriate. One person does all the talking; the other person prays that the Holy Spirit work in the hearers. Don’t interrupt one another or correct one another; you can “debrief” the encounter once the respondent has left. We find that most Americans are very interested in giving their opinion about anything, and will even wait in line to answer the questionnaire. So, the more public your locale, the more workers you’ll need. Be prepared! Make sure you have clipboards, pencils, and pamphlets ready to share with folks if they affirm they would like to hear what the Bible says about God, and the realities of life and death. If people need a Bible see if your church has some to give to seekers. If they want information about your church, have that ready too. If they say yes, go through the questionnaire. If no, offer them pamphlets. Fill out the questionnaire for them. That way, you should be able to read the handwriting, and you will get more complete answers than you would if they filled it out themselves. Avoid making comments about their answers. Your chance to speak will come. Right now, let them do all the talking—and listen carefully. What they say will help you understand where they’re coming from. 1. Do you attend a local church, mosque, temple, or synagogue? —If so, which one? 2. If so, how often do you attend? 3. If so, why do you attend? 4. Why do you think people don’t attend places of worship? 5. If you were looking for a place to worship, what kind of things would you look for? 6. Have you ever had a really intense spiritual experience with God? 7. What do you think will happen to you when you die? Now it’s time to deal with the ultimate spiritual reality. For many, they’ve never been asked this question. Even Christians will come up with answers that don’t sound orthodox at all. 8. May I briefly share with you what the Bible says about God and the spiritual realities of life and death? If yes, this is now your opportunity to talk. Go through the Our Spiritual Journey Together pamphlet with them thoroughly. If not, go on to the next question, and make sure to give them a pamphlet once they complete the questionnaire. 9. Do you have any specific prayer needs that we could pray with you about today? Sometimes they don’t. If they do, don’t save the prayer for later; pray with them right there. Remind them in your prayer that God loves and cares for them. Finish the questionnaire on a positive note. 10. Would you be interested in being a part of a Bible study to learn more about Jesus? 11. Would you like to attend church with me some time? Get this information especially when people have chosen to make a commitment to Christ, but also if they seem open to more information, curious about the church, or in any way positive about the questionnaire and answering it. Get the person’s name, address, phone number or email addresses. You need enough information to contact them later for further discussions. Get enough information that someone who is not on your team could actually continue the conversation with them. The rest of the data you can fill out on your own. Make comments about people’s receptivity, or any questions they might have had. Put your last name (first initial) and the names of any team members who were with you. Guess the person’s age and marital status; mark all appropriate boxes. If you were a member of the follow-up team, and hadn’t met this person, what information would you like to know? 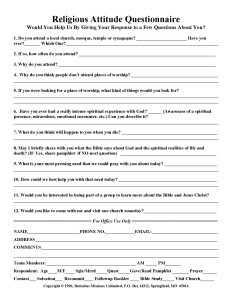 For follow-up, see the Discipleship Follow-Up Questionnaire. For a video introduction to the Religious Attitude Questionnaire and using booklets for sharing your faith see Part 12, Intentional Outreach Approaches of the Sharing Your Spiritual Journey with Others seminar. This session includes a thorough introduction into this approach in intentional evangelism efforts. For the complete training now available in video/flash file format go to Be His Witness, Part 1: Using Questionnaires and Booklets to Share the Gospel & Train Evangelists, a video seminar that specifically shows you how to use the Religious Attitude Questionnaire for outreach.